On September 12, 1940 four French boys stumbled into a complex network of caves in southwestern France. Their discovery of innumerable Paleolithic cave paintings dating to 17-15,000 BCE (Figure 1) soon led to excavations of the Lascaux cave system and in turn significantly altered scholars’ conceptions of human development.1 As evidenced by the wall paintings at Lascaux, the impulse to create is one of the earliest and strongest human aspirations. The activity of artmaking is exclusively a human activity, one that has been used for a host of reasons throughout history: ceremonial, ritualistic, educational, and of course for self-expression. Yet, today a pernicious myth seems to have distorted our understanding of art as a cultural product. Many perceive artistic products as part of an elite economy and therefore those products are destined for consumption by the upper echelons of society. On Tuesday, August 22nd 21c Museum Hotel in Lexington, Kentucky hosted artists Sharon Louden and Steve Lambert (Figure 2) for a discussion about a recently published collection of essays that confront this myth.2 The book, The Artist as Culture Producer: Living and Sustaining a Creative Life, is an anthology centered around the artist as an active agent for change in twenty-first century communities. The evening’s discussion coincided with the opening reception for 21c’s new exhibition, A Global Gathering. The exhibition is simultaneously a show about how cultural practitioners around the globe have attempted to raise awareness about various social issues and an exhibition that charts the evolution of the institution’s permanent collection since it was formed in 2006. Rather than a review of the exhibition or the anthology edited by Louden, what follows is my assessment of the claims and ideas put forward by the discussants during their thoughtful and open tête-à-tête. 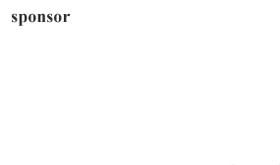 The concluding portion of my essay is an analysis of how some of the ideas in the book can be adapted and applied to Lexington’s own cultural landscape. A significant portion of the conversation revolved around the pressing need to alter the curriculum and culture present in programs grooming BFA and MFA students. Both Louden and Lambert elaborated that under the current paradigm students are taught that artistic success is largely measured by group and solo exhibitions at galleries and museums; winning prestigious fellowships and grants from well-known foundations; and having work collected by public and private entities. Indeed, by and large, this is the rigid model in place that aspiring creatives are expected to navigate in order to reach the top. However, many of the artists who contributed to the book want to change that model and its accompanying definition of artistic success. For instance, Lambert contends that if he had the choice between having a solo show at a museum or participating in a socially engaged art project in the Arctic Ocean, he would choose the latter. For him, he wants his intellectual and physical efforts in the artistic process to have a demonstrable impact on the circumstances and social issues he cares about rather than simply raising awareness in a traditional exhibition venue. He hopes to guide more students to consider this alternative version of artistic success, and overall feel more comfortable choosing opportunities that may not fit within the traditional template. Admittedly, Lambert has a point, but for the kind of projects he is describing (those on-the-front-lines, Yes Men-sque interventions) I believe one needs both exhibition models to effect lasting change (Figure 3). It is one thing to produce art for or participate directly in a protest, but ultimately to have a lasting impact artists must capitalize on the momentum created from their direct involvement. The gallery and museum space along with the format of the lecture circuit provides the ideal opportunity for artists to document their socially engaged installations, spread further awareness about the given topic to diverse audiences, and explain to communities how they can be part of grass-root solutions. This debate about art school education and varying models for artistic practices raises questions about the expectations, roles, and responsibilities of visual artists for today’s world. For Louden, Lambert, and many of those featured in the book series, they see an expanded role for artists because they feel creatives are uniquely positioned to present audiences with alternative perspectives. Further, they understand their work as having the capacity to manifest abstract ideas and present them in more compelling ways than other forms of discourse (essays, speeches, etc.). Therefore, they feel an obligation to produce works that challenge, question, and critique some of the most troubling social and political ailments of our time. The conversation that unfolded at 21c has parallels to the raucous debates that took place during the nineteenth century about the proper role of art and artists. The French poet and critic Charles Baudelaire repeatedly used the phrase Épater la Bourgeoisie (Shock the Bourgeoisie) to advocate for literature and other forms of artistic expression that went against the grain of the times; this phrase became a rallying cry for avant-garde artists of all stripes in the following decades. For many artists who took up this banner or anthem, they were reacting against the Salon culture which had bred complacency and a form of art that aimed to please and delight the upper classes. Increasingly, artists became interested in producing art that questioned, probed, and indeed shocked viewers. To a large extent, I agree with this conception of the artist and his or her place in society. My only fear is that too many artists will be lured into a type of political activism where the art object becomes semantically monovalent or subsumed by the larger political protest, thus rendering the artistic product as merely propaganda. Art, in its various forms, can be a powerful supplement to demonstrable protest actions because it can present messages and information in new light for the general public. But art must retain its multivalency in order to function as a veritable cultural product with multiple layers of interpretation. Artists must take caution to create work that can be interrogated on many levels; they should not completely flatten their products to a singular purpose as this would, in my estimation, severely depreciate the value of art as a cultural product. What is a Cultural Product and Why Should the Public Care? Of course, the evening’s conversation was not entirely geared toward creatives, as much of the back-and-forth between the moderators focused on understanding art as a cultural product and why the general public should care about it. Louden and Lambert in clear terms drew out an important point that many members of the general population tend to overlook: a cultural product does not have to be an object; rather, it can be a concept, performance, video, sound installation, or even an organized communal activity.3 This is a notion that many struggle with because unfortunately a widespread and misguided mindset about what constitutes art still dominates public consciousness. This attitude is one in which painting and sculpture are seen as the pinnacle of artistic achievement and figuration is given priority over abstraction. However, due to the pioneering efforts and achievements of various groups in the twentieth century (Dada, Situationist International (SI), Fluxus, conceptual artists, and performance artists), artists have challenged the definition of art, its role in society, and ultimately who it is produced for. In order to bring about greater tolerance for and interest in forms of art, artists, educators, critics, and curators must collaborate to successfully bridge the divide between the cultural product itself and the viewer. The question of how we bring cultural practitioners/producers, cultural interpreters/critics, and the general public closer together is a topic I am deeply invested in, and I wish Louden and Lambert could have devoted more time parsing out potential strategies. If artists are cultural producers and the general public is an assembly of cultural consumers with varying levels of interest, investment, and visual literacy, then curators, critics, and various educators serve as intermediaries who are tasked with translating, galvanizing, and charting out avenues of possible interpretation for consumer-spectators. When this stage of mediation or translation is executed successfully, the result is often audiences who walk away from projects, installations, or performances with greater context, understanding, appreciation, and overall tolerance for contemporary art. In order to begin convincing a greater percentage of the population that art is not an elite cultural product, but rather a fundamental component of any human’s life, we must take several steps: dispelling notions about what constitutes fine art and the arbitrary division between high and low culture; make art institutions and corresponding events less intimidating while eliminating financial barriers to entry; and create more public-private partnerships where local communities can sponsor site-specific installations and performances that relate to local neighborhoods and the challenges they may face. Many of the ideas and principles espoused by the visual artists in The Artist as Culture Producer can be applied to sites and situations in Lexington. There are quite a few venues in the city for the exhibition of contemporary art, including the University of Kentucky Art Museum, the Lexington Art League’s Loudoun House, 21c Museum Hotel, and Institute 193 among several others. Yet, there is a regrettable lack of cooperation across museums, galleries, art non-profits, educational institutions, and government agencies to commission site-specific installations and performances that can activate public spaces, shared histories, architectural styles, and engage members of the community. Lexington suffers from a lack of a centralized decision-making body with guiding policies concerning public art. There are many ad-hoc initiatives that attempt to bring the public in contact with more contemporary art: gallery hops, annual mural commissions through independent curators (Prohibition), and intellectually insipid public art commissions (i.e., the Las Vegas-themed light sculptures on Oliver Lewis Way bridge). However, rather than spread financial and human capital thin through these splintered and disjointed approaches to public art, I advocate for pooling resources to design evocative, cerebral, and publicly commissioned cultural products. So, here is my cri de coeur: the Urban County Art Review Board must build stronger relationships with the aforementioned art organizations; develop a more robust and comprehensive vision for activating public spaces and buildings; and most importantly regularly schedule cultural programming at these sites that incorporate digital humanities initiatives (i.e. QR codes that link to additional information about the historic site, information about the artist(s), and didactic material about the commission).4 It is not enough to commission public works of art, the sponsoring body must also provide interpretative material and sustained programming. There are many locations where projects such as this can be carried out, such as the Mary Todd Lincoln House, Cheapside Park, Henry Clay’s Ashland Estate, and Waveland State Historic Site. With the imminent removal of two monumental, honorific Confederate statues from Cheapside (Figure 4), Lexington has an exceptional opportunity to commission either a permanent installation, a temporary work of contemporary art, or even organize a performance, video, or sound piece. My hope is that a potential commission will capitalize on the inherent power embedded in the site, the content of the work will directly engage in a contemporary problem related to the city, and produce intellectually rigorous and accessible discursive material for spectators (either on site or digitally). Public commissions that accomplish these goals have the power to begin convincing more members of the general population that art is not always an object hanging on a gallery wall or resting on a white pedestal. Instead, art can be a fleeting performance or a concept that is realized materially and then dis-assembled, art can invite active participation rather than passive spectatorship, and, significantly, art can be a cultural product that is part of every citizen’s life regardless of class or status. 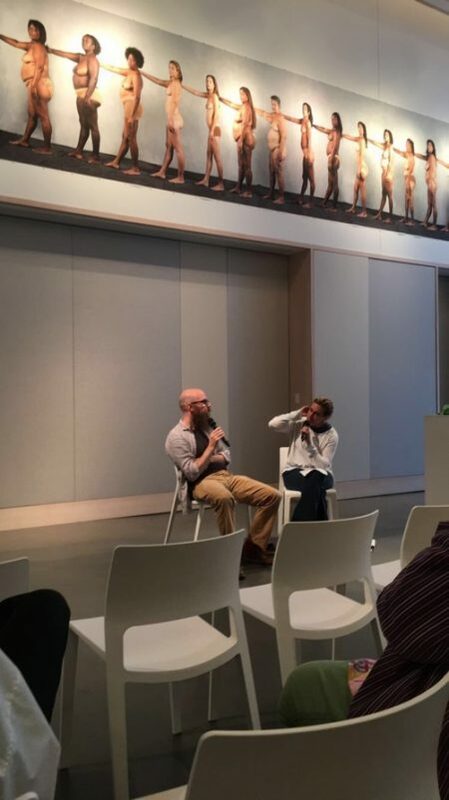 In short, the book tour conversation for The Artist as Culture Producer: Living and Sustaining a Creative Life between Sharon Louden and Steve Lambert proved to be a stimulating and engaging event. For the most part, I found their proposals and ideas about art education, socially engaged initiatives, and the protean role of the artist in the twenty-first century to be compelling. In her opening comments, Louden expressed a sincere desire that conversations like those that took place at 21c in Lexington would cross pollinate ideas between local cultural practitioners and leaders with the creative minds who helped author the books in the series. Given that several members of Lexington’s cultural leadership were in attendance, my hope is that a critical mass of invested community members will begin to reflect on how to make contemporary art, specifically socially engaged art in new forms of media, more relevant and accessible to those who call the city home. As Lexington’s artistic topography expands, the need for a public art organization–one that has the means to not only commission works but also continually activate sites–will only become more urgent. 1 Tedesco, Laura Anne, “Lascaux (ca. 15,000 B.C. ),” in Heilbrunn Timeline of Art History, New York: The Metropolitan Museum of Art, 2000, http://www.metmuseum.org/toah/hd/lasc/hd_lasc.htm. 2 Steve Lambert is Associate Professor of New Media at SUNY Purchase College, co-founder and co-director of the Center for Artistic Activism, and overall a socially engaged artist deeply interested in exploring and critiquing the history of advertising. One of his most famous projects is called Add-Art, a Firefox add-on that replaces online advertising with art. See his professional site: https://visitsteve.com. 3 For example, the Complaints Choir initiative has led to many urban communities coming together to write original songs about the common woes of living in their respective cities. http://www.nytimes.com/2009/12/09/arts/music/09complaint.html?pagewanted=all&mcubz=0. 4Public Art Fund and Creative Time in New York City are exemplary models of how local communities can recruit contemporary artists, commission site-specific works, and sponsor relevant and engaging public programming for citizens and visitors alike. See https://www.publicartfund.org and http://creativetime.org. Cave Painting, ca. 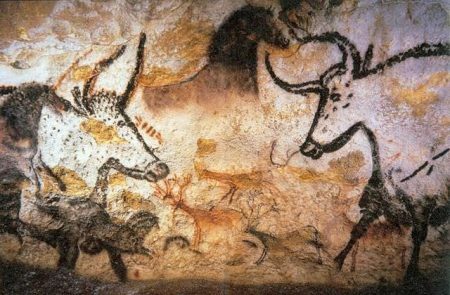 15,000 BCE., Upper Paleolithic period, Lascaux, France. View of Steve Lambert (L) and Sharon Louden (R) within one of the main exhibition galleries at 21c Museum Hotel-Lexington. 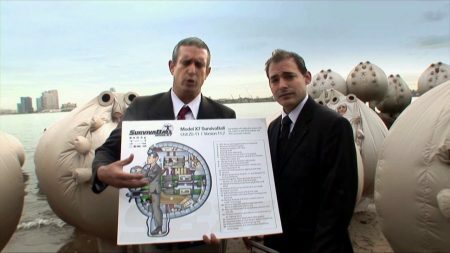 View of artist-activists Andy Bichlbaum and Mike Bonnano (The Yes Men) staging one of their absurdist interventions along the East River in New York in 2009. In this particular socially engaged project, they set up a demonstration to test their fake Survivaball Climate Suits that were supposed to protect civilians once the effects of climate change became irreversible. 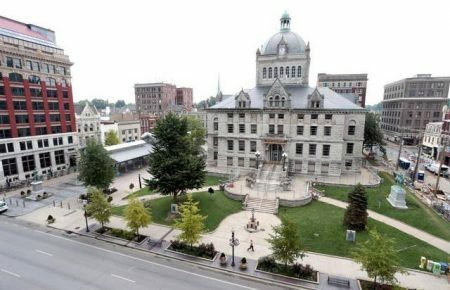 Cheapside Park in downtown Lexington featuring the Old Fayette County Courthouse and statues of John Hunt Morgan and John C. Breckinridge. Very informative and enlightening. Excellent review.